Acura partnered with Graham Rahal Performance to create a 345-hp RDX. Acura is arriving at this year’s SEMA Show with products both new and old – a one-show automotive reunion tour of sorts. The Japanese luxury automaker will have several models on display ranging from the NSX supercar to the RDX crossover. While the NSX draws eyes, the 2019 RDX A-Spec at the show is the real Las Vegas star. Acura partnered with Graham Rahal Performance to enhance the all-new crossover’s performance and handling. GRP did more than upgrade the suspension and spice up the interior styling. The tuner tinkered with the engine, enhancing the RDX’s stock turbocharged 2.0-liter engine. The company added a new turbocharger, intake and exhaust manifolds, and downpipe. The crossover received a custom intercooler and intake setup from PRL with GRP developing a unique cat-back exhaust. The GRP RDX produces an estimated 345 horsepower and 370 pound-feet of torque. Eibach sport springs lower the RDX two inches. Twenty-one-inch HRE P101 wheels, wrapped in 265/40 Michelin Pilot Sport 4S tires, house six-piston StopTech brakes. Power routes to all four wheels thanks to Acura’s Super Handling All-Wheel Drive system. Exterior upgrades include Apex Blue Pearl paint, and custom carbon mirror caps and grille accents. The interior also receives carbon fiber accents along with a custom steering wheel designed by Max Papis of MPI Innovations. The seats, black leather sport seats with Ultrasuede accents, remain. The GRP RDX is Acura’s Vegas darling; however, the company has a few tagalongs. The Acura NSX GT3 Evo, which earned a second-place finish in the 2018 IMSA Weathertech GTD Championship, will be there, along with the road-going 2019 NSX in Thermal Orange Pearl paint. Other race cars there include the Acura ARX-05, which raced in the IMSA WeatherTech SportsCar Championship 2018 season, and the RealTime Racing TLX GT that returned to Pikes Peak earlier this year. Rounding out Acura’s SEMA display is a 2019 Acura ILX decked out in Acura accessories to show customers the sedan can have a sporty side. The 2018 SEMA Show kicks off today, Oct. 30. Acura returns to the Specialty Equipment Manufacturing Show (SEMA) in Las Vegas, Nevada to display its commitment to performance, motorsports and the tuner community. 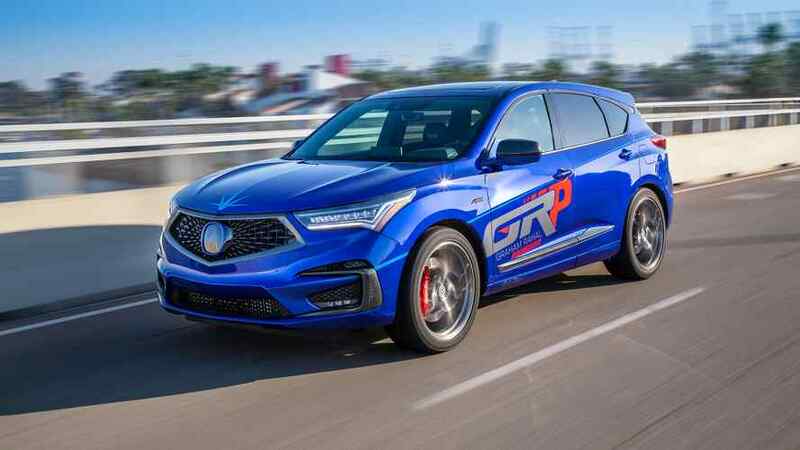 A custom 2019 RDX A-Spec designed and built by Graham Rahal Performance (GRP) adds style, power and performance to the quickest, best-handling RDX yet. Fresh from Victory Circle, the race-ready NSX GT3, hill climb-conquering TLX GT and Acura ARX-05 Daytona Prototype showcase recent Acura Motorsports successes. Production cars on display include the newly updated 2019 NSX in Thermal Orange Pearl dress and an accessorized version of the refreshed 2019 ILX. 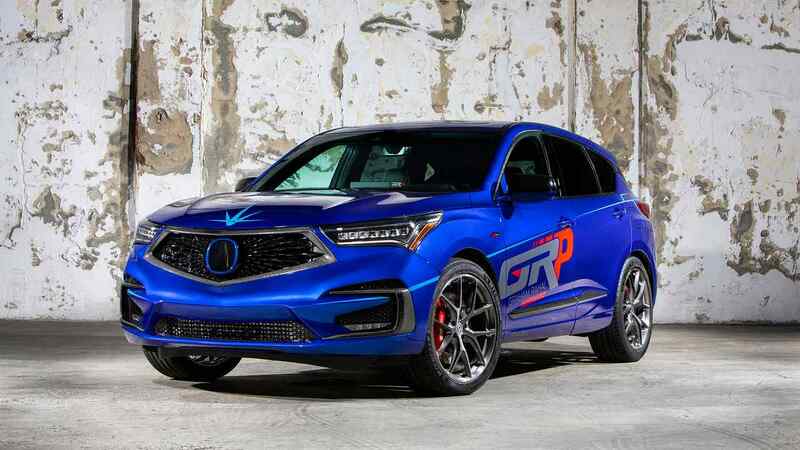 Graham Rahal Performance, founded in 2017 by race-winning Honda IndyCar driver Graham Rahal, took on the all-new 2019 Acura RDX A-Spec with a goal of enhancing the performance through subtle but significant updates to the RDX's powertrain, suspension, brakes, and wheel, tire package. "As owners of an Acura dealership, we know how strong the new 2019 RDX is out of the gate. I didn't want to mess with a good thing," said Graham Rahal. "Sometimes, subtle enhancements can make a big difference in the look of a vehicle. And that's exactly what my team and I aimed for with this GRP RDX." Using its experience in tuning the Civic Type R, GRP upgraded the RDX's factory 2.0-liter DOHC VTEC® Turbo engine with a new turbocharger, intake and exhaust manifolds, and downpipe. PRL Racing fabricated a custom intercooler and intake setup, while GRP developed a custom lightweight cat-back exhaust system. Ensuring everything works in harmony, KTuning created a custom ECU map for the boosted RDX. All-in, the GRP RDX produces an estimated peak output of 345 horsepower and 370 lb-ft of torque, channeled through the RDX's available torque-vectoring Super Handling All-Wheel Drive™ (SH-AWD®) system. Chassis modifications include custom Eibach sport springs that lower the RDX by two inches, while stopping performance is improved by six-piston StopTech brakes. Lightweight HRE P101 wheels in 21-inch diameter are wrapped in 265/40 Michelin Pilot Sport 4S tires, giving the GRP RDX A-Spec an aggressive and purposeful stance. The GRP RDX is painted in Apex Blue Pearl, an A-Spec exclusive color, supplemented with GRP custom carbon mirror caps and carbon grille accents, along with body-color painted lower garnish, giving the RDX an even lower appearance. Interior styling modifications include carbon fiber accents and a custom steering wheel designed by renowned racing driver Max Papis of MPI Innovations. The GRP RDX retains the A-Spec's unique black leather sport seats with Ultrasuede® accents. A longtime partner throughout Rahal's racing career, Troy Lee Designs consulted on the design of the vehicle and installed custom graphics in its Southern California design studio. Following two successful racing campaigns, culminating in five race wins and a second-place finish in the 2018 IMSA Weathertech GTD Championship, the NSX GT3 was recently revealed in updated Evo form. The NSX GT3 Evo improves upon the race-proven NSX GT3 with a host of updates aimed at better performance and reduced running costs for an even wider range of amateur and professional drivers. The NSX GT3 Evo's lightweight carbon fiber bodywork has been modified for reduced drag to create higher top speeds, better balance and drivability at all speeds, and improved cooling. The new bodywork includes a new front splitter, rear diffuser, and rear bumper. The GT3 Evo receives new turbochargers for better throttle response, boost control and improved fuel economy. Additionally, the NSX GT3 Evo benefits from an improved anti-lock braking systems, an upgraded Bosch display and data-logging unit to increase efficiency and enhance the driver experience. Existing owners can have their NSX GT3s retrofitted to Evo-spec through Variant Supply. The GT3 race car's bespoke chassis is built alongside the road-going version of NSX at the Performance Manufacturing Center (PMC) in Marysville, Ohio1. The 3.5-liter twin-turbocharged V6 racing engine uses the same design specifications as the production car, including block, heads, valve train, crankshaft, pistons and dry-sump lubrication system and is assembled alongside the production engine at the Anna Engine Plant (AEP) in Anna, Ohio. Offered for sale globally strictly for racing, the NSX GT3 Evo is eligible for competition in more than two dozen racing series. More information is available at AcuraClientRacing.net. Arriving in driveways just in time for Halloween, the 2019 NSX shines in its new Thermal Orange Pearl hue. Unveiled at Monterey Car Week in August, the 2019 Acura NSX features a host of appearance and mechanical updates aimed at enhancing the unique style and performance of Acura's electrified supercar. Along with new exterior and interior color options, the 2019 NSX is distinguished by a body-color front grille accent and high-gloss treatment for the front air intake, rear fascia outlet mesh, and available exterior carbon fiber packages. The 2019 NSX rides on enhanced suspension and new Continental SportContact™ 6 tires developed specifically for NSX for improved control at-the-limit. The result is a nearly two-second faster lap time in testing around the world famous Suzuka Circuit. The 2019 NSX is available for order now, and starts at $157,5002, with $4,700 in previously optional content now standard. With the ARX-05, Acura returned to the competitive world of prototype sports car racing with legendary partner Team Penske, campaigning two Daytona Prototypes in the IMSA WeatherTech SportsCar Championship in the 2018 season. The driver duo of Dane Cameron and Juan Pablo Montoya drove the ARX-05 to the podium four times in the team's inaugural season, while Ricky Taylor and Helio Castroneves secured two podiums, including a win in the Acura Sports Car Challenge at Mid-Ohio. The ARX-05 is powered by Acura's race-proven AR35TT twin-turbocharged V6, based on the production V6 that powers the Acura MDX, TLX and RLX. The AR35TT has powered class wins at the 12 Hours of Sebring, the 24 Hours of Le Mans, and an LMP2 World Endurance Championship in 2012; the American Le Mans Series LMP2 title winners in 2012 and 2013; and the overall victors at the Rolex 24, 12 Hours of Sebring and Petit Le Mans in 2016. The all-wheel-drive RealTime Racing (RTR) TLX GT race car, piloted by Peter Cunningham, returned to Pikes Peak in 2018, taking first-in-class and third overall at the grueling and famous hill-climb event. The podium finish was quickly followed with an Exhibition Class win and new all-time course record of 18:539 in the Empire Hill Climb in Empire, Michigan. Previously campaigned in the Pirelli World Challenge, the twin-turbocharged RTR TLX GT features suspension, engine management and transmission gearing specially tuned to tackle the many challenges presented by hill-climb events. The refreshed and redesigned 2019 Acura ILX, featuring Acura's signature Diamond Pentagon grille, just hit showrooms with updated interior and exterior styling, and substantial improvements to technology, including standard AcuraWatch™, and available Apple CarPlay™ and Android Auto™ integration. The accessories displayed on the 2019 ILX A-Spec showcase Acura's performance-inspired design with front and rear underbody spoilers, 18-inch black alloy wheels, and satin silver door mirror covers. In addition, the ILX A-Spec features dark chrome accents in the rear and lower side trim, and black chrome badges. Inside are A-Spec floormats, red interior illumination, and A-Spec door sill trim.